132. 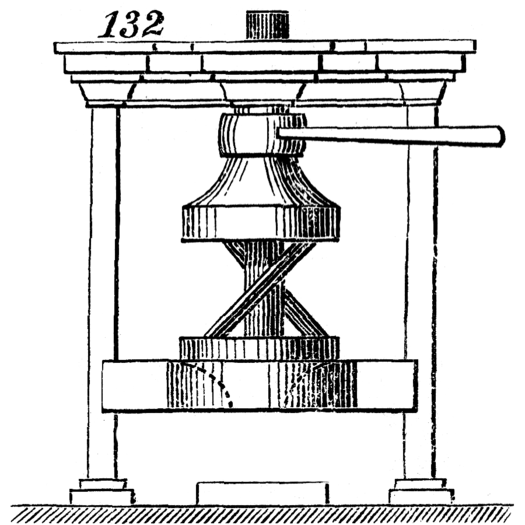 This is a motion which has been used in presses to produce the necessary pressure upon the platen. Horizontal motion is given to the arm of the lever which turns the upper disk. Between the top and bottom disks are two bars which enter holes in the disks. These bars are in oblique positions, as shown in the drawing, when the press is not in operation; but when the top disk is made to rotate, the bars move toward perpendicular positions and force the lower disk down. The top disk must be firmly secured in a stationary position, except as to its revolution.